You are here: Home / Featured Stories / National Institutes Of Health to Host Rare Disease Day Event; Dr. Francis Collins To Speak; Wear Jeans! The National Institutes of Health (NIH) will celebrate the 4rd Rare Disease Day on February 28, 2011, with a day-long celebration and recognition of the various rare diseases research activities. The event will be held in the Lipsett Amphitheater from 8:30am to 5:15pm. Dr. Francis Collins is expected to speak. A tentative agenda has been posted. 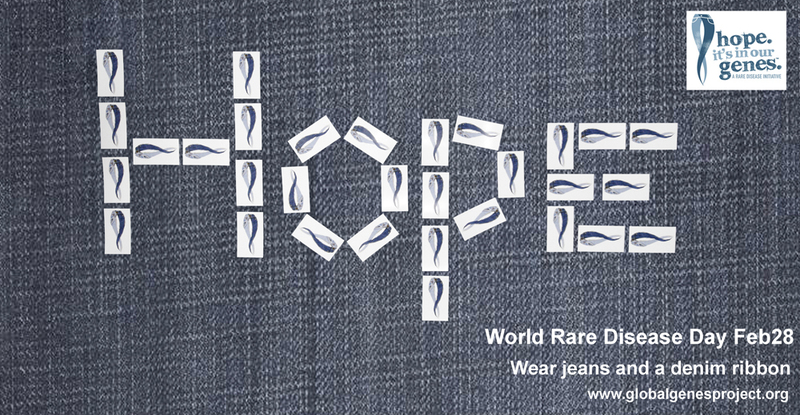 In association with the Global Genes Project, the NIH Office of Rare Diseases Research is encouraging all attendees to wear their favorite pair of jeans to the event to support the Global Genes Project awareness campaign. The Global Genes Project awareness campaign is designed around a denim blue jeans theme and a blue denim ribbon which has become the unifying symbol of hope for the rare disease community worldwide. Check out our kid volunteers who make ribbons! Denim blue ribbons will be distributed at the event and the Global Genes Project will be bringing some of the 7000 Bracelets of Hope which have also been made by volunteers around the world to represent the 7000 rare diseases that afflict an estimated 250 million people globally. Supporters from the NIH Clinical Center, the NIH Institutes and Centers, the Health Resources and Services Administration (HRSA), the Food & Drug Administration’s Office of Orphan Product Development (OOPD), the National Organization for Rare Disorders (NORD), and the Genetic Alliance will also be at the event. Attendance is free and open to the public. Unfortunately, I will not be able to attend as Pfizer is holding a Rare Disease Day 2011 event the same day and I have been invited to speak along with other rare disease advocates.